With the market season back in full swing, we are spending more time in the kitchen devising ways to best enjoy our weekly bounty. 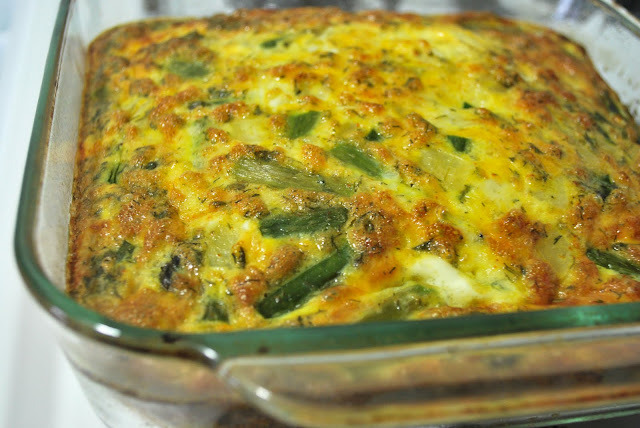 We have plenty of asparagus and last week I blogged a recipe of an asparagus egg bake my wife and I enjoyed. The asparagus can be and should be used in a myriad of ways. This speedy growing member of the lily family, asparagus is a nutrient rich food, high in folic acid and is a good source of potassium, fiber, vitamin B6, vitamins A and C, and thiamin. We are big about fiber in this house and Asparagus has about 3 grams of fiber per 5 ounces, but only contains about 20 calories for the same amount. Did somebody say Super Food? Besides nutrition, asparagus is delicious no matter how you prepare it, and the methods are many. You can grill it, boil it, steam it, include it in risotto, pasta, soup, salad, stir fries...I could go on. So with all of those methods at our disposal, we decided to make the same egg bake. How good does that look? For real. I used the same recipe from last week except I added a quarter tsp. of Cayenne Pepper. Definitely gave it a kick. Next week I'm going to change it up and make it with fresh spinach and feta. Anybody have a good recommendation for where to get feta? Lay it on me. Speaking of making the same thing over and over again...all winter I have been making potato soup. Like all winter. I really don't know if I have ever posted the recipe before but no matter, it is way better now than when I started making it so I want to post the recipe I have pretty much anointed as the standard potato soup recipe my family will use ad infinitum. Combine the potatoes, celery, onion, ham and stock in a stockpot. Bring to a boil, then cook over medium heat until potatoes are tender, about 10 to 15 minutes. Stir in the chicken bouillon, salt and pepper, celery seed and garlic. In a separate saucepan, melt butter over medium-low heat. Whisk in flour with a fork, and cook, stirring constantly until thick, about 1 minute. Slowly stir in milk/cream as not to allow lumps to form until all of the milk has been added. Continue stirring over medium-low heat until thick, 4 to 5 minutes. Stir the milk mixture into the stockpot, and cook soup until heated through. If anybody has any ideas about how to perfect these recipes, we are all ears. Please post your ideas and if I use them, I will surely give you credit!